Paper shoes make beautiful additions to home decor or party decorations. They can also be a fun way to deliver small treats or gifts tucked into the toe. Learn how to make some paper shoes of your own to use in a variety of ways. The basic design of the shoe is simple, and it can be made using any pattern of paper. Once you make the shoe, embellish or decorate it however you wish to personalize the design. Download and print the template at right by clicking on the image, and then printing or saving the .pdf file. Make sure that your settings reflect the printing to be "full page." You can print it on regular paper or cardstock, whatever your comfort level is for using these pieces to trace around. Cut out the shapes. Trace out and cut two copies of the sole portion of the template from the same sheet of paper; one will become the interior of the shoe, and the other will become the bottom. After you cut the first sole, flip the template over and trace and cut the second one out in mirror image. Trace out and cut two copies of the heel portion of the template, one from each of the papers. After cutting the first heel, flip the template over and cut out the second one as a mirror image. 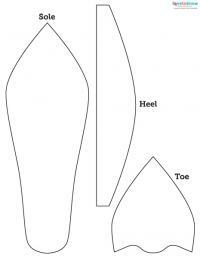 Set the toe template down on the paper of your choice. Instead of tracing its shape exactly, trace around the template 1/16 to 1/4-inch away from the template. The difference in size accounts for how much "room" you want in the toe. For example, if you are planning on using the shoes to hold some chocolates, enlarge the toe 1/4-inch all the way around. If you want the shoes to be decorative only, trace about 1/16-inch around. Cut out the toe. Place one of the soles right side up on the worktable in front of you and apply a small amount of glue to the top front of the toe. Place the point of the toe portion on top of the point on the sole. Keep it held in place with one finger while you line up one edge of the toe portion on top of the sole; the other side will extend way past the sole. This is normal. Glue the toe to the sole on this side so the two papers line up. Gently bend the paper of the toe to "tent" it up above the sole so the paper edges on the other side line up perfectly. This will give your toe some lift. Glue the edges together. Glue the two heel back pieces together right sides out. Measure in about 1/8-inch along the straight edge of the heel back and score along this line. This will allow this section to bend. Cut a few small triangles out of the bottom portion of the heel below your score line. This will make it much easier to bend and attach the heel back. Bend the resulting tabs on the straight portion of the heel inward so they sit parallel with the rest of the heel back. Apply glue to the tops of each tab, then center the heel of the sole with the heel back and press the sole onto the tabs. Wrap the heel around the sole, pressing into the tabs to hold it. Flip the shoe over and glue the second sole on the bottom of the shoe, hiding your heel tabs and providing a decorative bottom. Embellish your shoe if desired by gluing rosettes to the toe and a ribbon around the top edge of the heel back. To print out a set of these instructions, click on the image below to open up a .pdf document. From there, you can save the instructions or print them out right away. 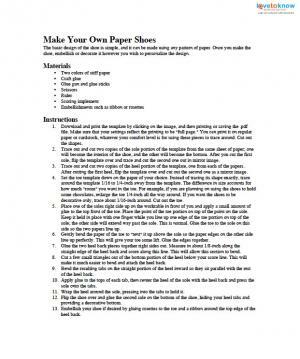 Don't forget to print out the template as well so it's ready when you want to make your paper shoes. Click here to print out the instructions. By varying the papers, the lift of the toe and the embellishments, you can create a variety of different shoes. Download this free template today and get started on your own pair of paper shoes.